The International Students and Scholars Office (ISSO) staff advises more than 1,000 international students, faculty members, scholars, and their dependents from over 80 countries on matters relating to immigration as well as academic, social, financial, and personal concerns related to daily life in the United States. The ISSO also provides programs to serve the needs of international students, researchers, and faculty through immigration advising and cultural adjustment programs. The ISSO collaborates with other campus offices and student organizations to develop and implement educational and co-curricular programs designed to heighten cultural awareness, appreciation of cultural diversity, and intercultural understanding for all students. A blog website hosted by a group of student writers dedicated to sharing international student experiences here in the United States. Their experiences will tell you all about their living and studying here at Clark University. The Global Scholars Program (GSP) is a special program for incoming international students who have demonstrated outstanding leadership in their home communities before attending Clark. Global scholars receive guidance and opportunities to build on their leadership skills so they can make a difference at Clark, in the Worcester area, and in the global community. Global Scholars are paired with an administrator mentor who assist them throughout their time at Clark. GSP participants will receive a scholarship of between $5,000 and $25,000 per year (contingent upon meeting academic standards for renewal) and are eligible to receive a $2,500 stipend to pursue and approved project of their own initiative during the summer after their junior year at Clark. What are the Global Scholars Doing? Global Scholars participated in discussion panels regarding issues of global significance. Some topics covered have been human trafficking, illegal arms trade, HIV/AIDS, and gang violence. Community Service included participation in Just Do It Day, clothing drives, a benefit concert for the Worcester County Foodbank, cultural presentations Worcester youth groups and schools, fundraising global game night to benefit a local African community, a TedX event and more. Each Global Scholar is paired up with an administrative mentor. These individuals will help Global Scholars adjust to life at Clark and assist them throughout their time at Clark. Students meet up with their administrative mentors periodically throughout the year. Global Scholars are required to attend meetings led by the GSP Student Coordinator during the academic year. If a student cannot attend the meeting due to a class conflict he/she must contact Patricia Doherty in advance. Each Global Scholar is required to complete community service during their time at Clark. Global Scholars volunteer in a variety of ways at Clark and in the Worcester community. Global Scholars are expected to maintain both an annual GPA of at least a 3.0. Failure to do so may result in a decrease or loss of Global Scholar scholarship. If any of the above requirements are not met, the Global Scholar may be placed on probation and/or have a reduction or loss of scholarship. Stipends are usually awarded for summer internships that are approved by Career Services. Contact Patty Doherty, ISSO Director for more information. Have you ever had a situation when you’re asked “WHERE ARE YOU FROM” and it is actually quite difficult to say a one-word answer? Well, you’re not alone. Clark University is home to a vibrant community of Third Culture Kids and Global Nomads! A person of any age or nationality who has lived a significant part of his/her developmental years in one or more countries outside his/her passport country because of a parent’s occupation. Children raised as global nomads can be the offspring of diplomatic, international business, government agency, international agency, missionary, or military personnel, or indeed of people living internationally mobile lives for any professional reason. Typically, global nomads share a unique cultural heritage. The International Students and Scholars Office offers support services for Clark’s TCK community. Our TCK Student Coordinator, Kaiomi Inniss holds regular meetings and social activities with TCKs. Please feel free to contact Kaiomi! She also holds weekly office hours to meet with TCKs who are interested in learning more about the TCK community at Clark and in Worcester. Contact Kaiomi (kinniss@clarku.edu) to find out when and where. In addition to serving as the TCK Student Coordinator for the 2017-2018 Academic Year, Kaiomi is the chair for the 2018 TCK Conference. 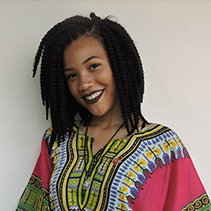 Kaiomi was born in Trinidad and Tobago, moved to the United States, and then to Barbados. She is a junior majoring in Global Environmental Studies. She loves to read, write and travel. Please feel free to contact Kaiomi! Every year, the ISSO hosts an Annual Third Culture Kids/Global Nomads Conference. The conference offers a variety of sessions that will be of interest to TCKs and their allies as well as faculty, staff and administrators who work with these students.